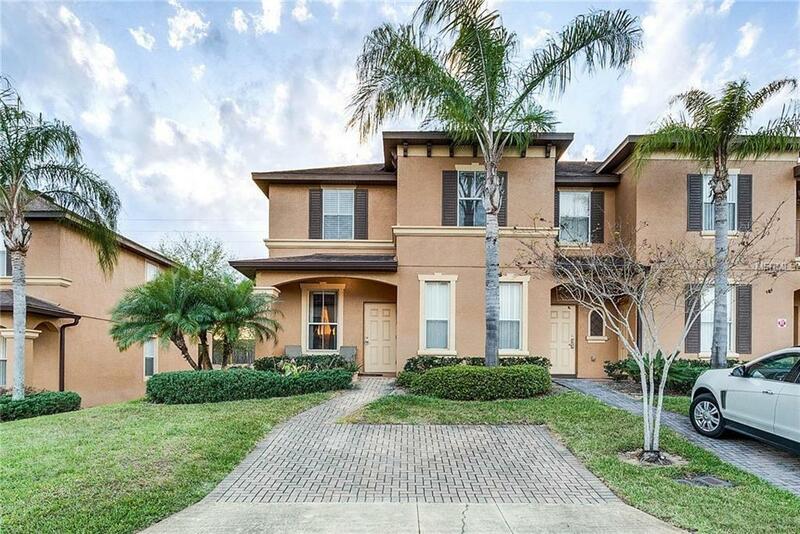 Come see this wonderful Townhome located in the Resort Style Regal Palms community. This 4/3.5 end unit has the largest floor plan in R.P. Features a downstairs master with outside access that is ADA compliant as well as an upstairs master bedroom with attached balcony. Unit has been updated with new a/c and carpeting in 2015 and NEW kitchen appliances in 2017. The Regal Palms community has everything to enjoy a relaxing day including a clubhouse with fitness center, spa, and bar, along with a pool featuring waterslides and a lazy river! This unit will come partially furnished and available for SHORT TERM RENTAL. Seller is requesting a 30 day lease back. Located within minutes of Walt Disney World and other local attractions, check out this must see property! Amazon Smart Home upgrade (Value of $2,500) is available with the purchase of this home.